I have a Winter birthday and always thought the kids that had a summer birthday were so lucky because they got to do all of the fun outdoor things for their parties. Then I got older and realized there are lots of fun Winter activities: ice skating, sledding, move and hot chocolate, indoor swimming. No matter when your birthday or your kids birthday is, there is one thing they usually have in common: Cake. Whether it is one big cake, or small cupcakes it is almost a must at a birthday party. 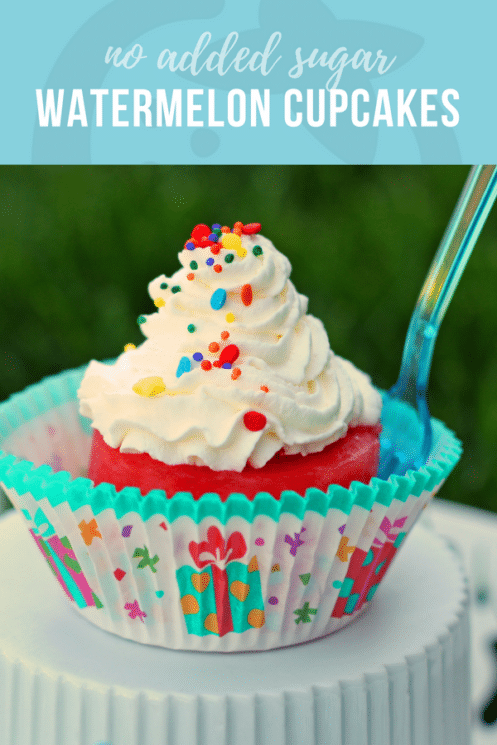 This Watermelon Cupcakes Recipe is a great alternative to traditional cupcakes for those of you who may be concerned with allergies, too much sugar/junk on birthdays, processed foods, etc. They have 2 ingredients: Watermelon + Whip Cream. You can also use coconut cream if your kids don’t eat dairy. The sprinkles definitely aren’t necessary, but do add an element of fun for kids. There is no added sugar at all – even in the whip cream. 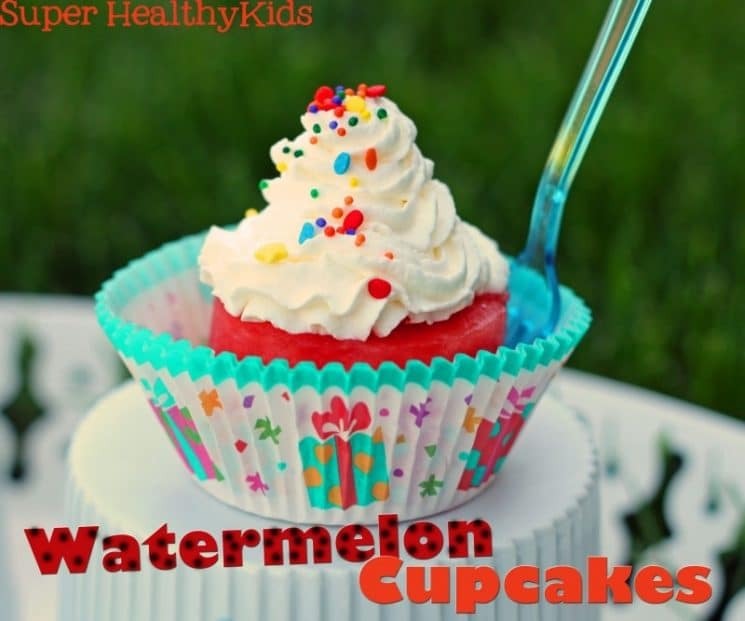 The sweet juiciness of the watermelon is plenty of sugar for these cupcakes. To make these you will need a seedless watermelon. Slice 2 thick slices about 1 1/2 inches thick. You will need some sort of round cutter to cut cupcake circles out of the slices. I used a smaller one for the mini cupcakes, and a larger for the regular cupcakes. Once you have your circle, take a paring knife and cut around the cut out circle to trim it to the size of the cupcake paper. The key to this is to not eat anything before starting this because you will want to eat all of the watermelon trimmings in the process. The other key is that you will need 2 cupcake papers for each cupcake. If you just use one, the juice will soak through it and it won’t hold its shape. 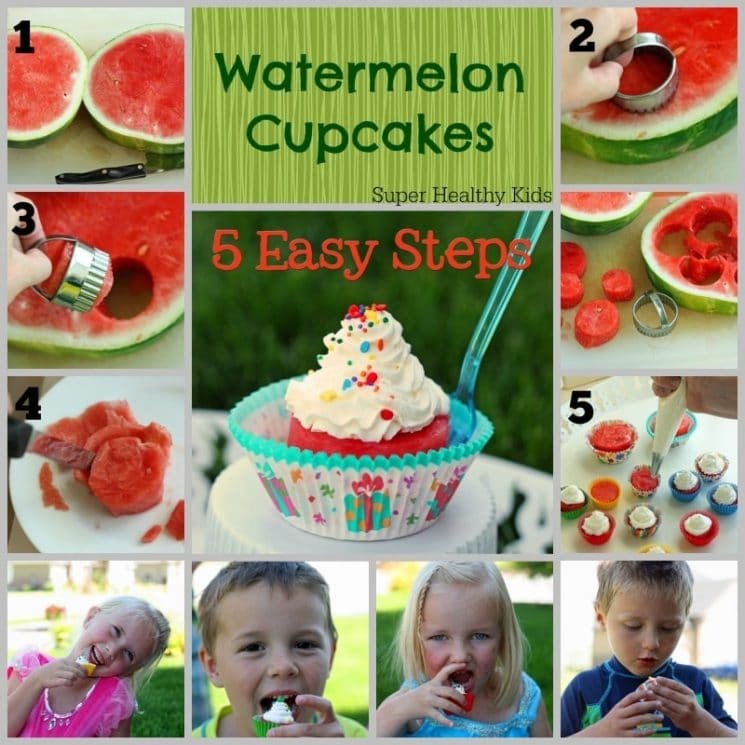 Every slice of watermelon will make about 2 large cupcakes, and about 8 mini cupcakes depending on the size of your watermelon. The one I used was probably considered a large melon. After you get your cupcakes cutout, whip up some cream. I bought a pint and didn’t even use half of it. You will want to whip it until it is very thick. Then pour into a piping bag to frost the tops. OR, there is this awesome tool that dispenses your homemade whip cream! These cupcakes were a big hit. I was on my front lawn taking pictures and some of our cute neighbor boys rode by and were intrigued. They were my taste testers and loved them. 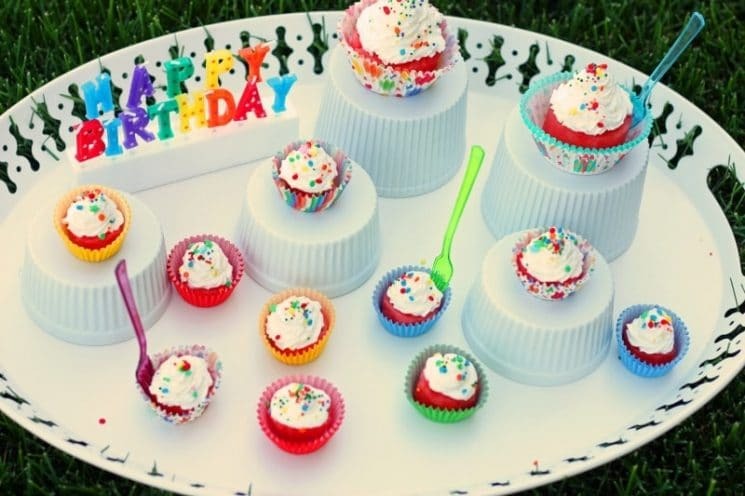 Serve these refreshing and healthy cupcakes at your next birthday party! Using a round cutter, cut circles out of the watermelon. Trim to fit your cupcake papers or molds. Place watermelon circles in the cupcake papers or mold. If using papers, use 2 papers for each cupcake. Whip cream until very thick. Using a piping bag or whip cream dispenser, frost the cupcake in a circle motion. Loved the guest towel cupcake; I am going to make them for all ocacnsioss and for my bathrooms. I have seen so many other videos, but you are the best. Thank you so much. What a great idea! My husband & I are doing a “camp” for our two 4 year-old grandchildren and I’m thinking we could have a watermelon-art activity on the picnic table! Slices of watermelon for each of us and plenty of cookie cutters!! Instant, healthy, messy-enough-to-be-cool fun! Thanks for posting! How long will the cream hold its shape? I just want to say first – I love your site and have tried many of your recipes and we have loved them all. Second, I just wanted to ask a question about watermelon – Would watermelon bake okay in a regular flour cupcake? 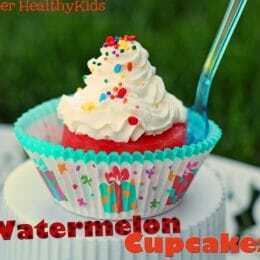 Although, your watermelon cupcakes are cute and I’m sure delicious; I am looking for a regular cupcake to make. Just hoping you will know…I’ve never tried to bake with watermelon before. Thanks a bunch! can I make these a day (or 2) ahead of time? Leaving off the whipped topping (I can do that quickly the day of) or will they get too messy? I would like to get them all cut up and into their cupcake cups (using doubled up paper ones) the day before. Thanks for this great idea!! I wouldn’t put them in the cupcake papers ahead of time. Watermelon tends to lose its juices after it is cut and so the papers would get soggy and probably tear. How delicious cupcake recipe! This cupcake literally has my mouth watering! YUMMY! thanks for sharing nice cup cake recipe.